Mummy Coffin Corn Dogs are a 4-ingredient spooktacular Halloween savory dish that can be prepared in 15 minutes. A fun, kid-friendly treat! Halloween? A synonym for fun, especially for our little monsters. 😉 These Mummy Coffin Corn Dogs are fright bites that will have them “howling” with delight, and make entertaining this Halloween a snap! Did I just hear someone scream “SPOOKTACULAR”?! As some of you may know, I didn’t grow up celebrating this fun event. But as an adult I have had the pleasure of dressing up in costumes, entertaining, attending Trunk of Treats at church, and going trick-or-treating with my daughters in our neighborhood. No shame in admitting that when Halloween rolls around, I transform into a child! Who doesn’t, right? Shhhhh! Yes, of course we eat lots of candy. 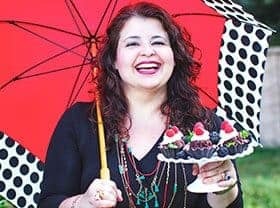 But my family and I (and our guests) also enjoy having yummy and simple savory dishes, making cutting back on sugar way less painful! 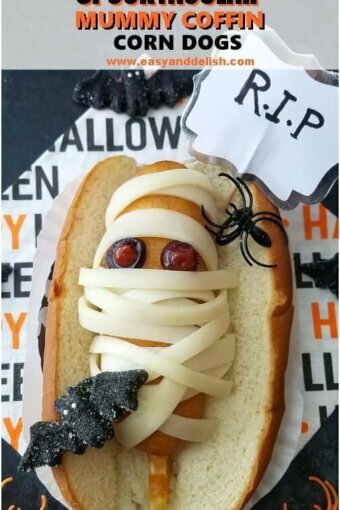 We will be preparing Mummy Coffin Corn Dogs made with State Fair® Corn Dogs tucked into hot dog buns and mummified with mozzarella cheese strips. Easy Peasy! Yep! We set some scrumptious “bloody chunky worm” fright bites made with Tyson® Crispy Chicken Strips (Fully cooked, 100% white meat), mustard eyes, and barbecue sauce pool out on the table to complement our party spread. You know what? 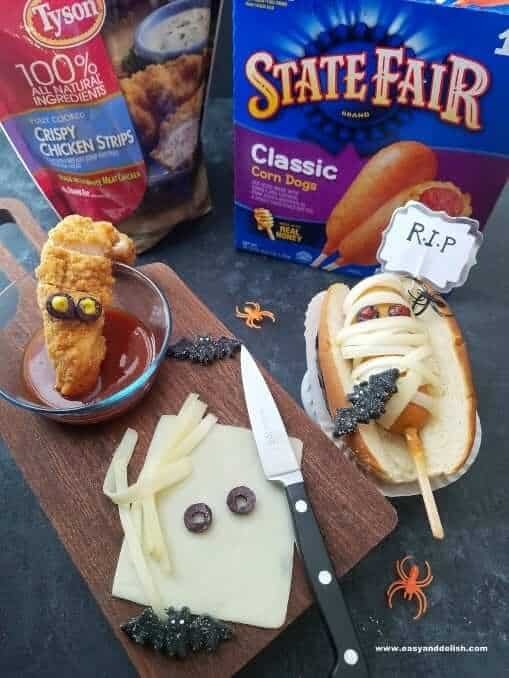 They are freaking delicious, and even simpler to put together than the Mummy Coffin Corn Dogs. We are talking here about a 1-minute per strip party dish when heated in the microwave! And for a third savory treat, I suggest fully cooked Hillshire Farm® Lit’l Smokies® Smoked Sausage for bewitchingly delicious witch fingers (and slivered almonds for the nails). 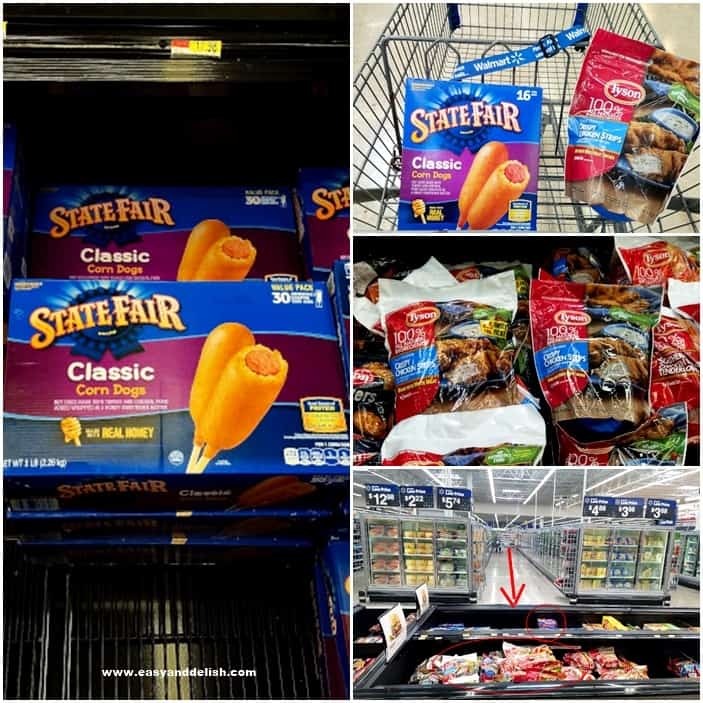 As you can see, Tyson®, State Fair®, and Hillshire Farm® are your Halloween go-to products, delivering convenience and deliciousness at every bite. All the ingredients for our Halloween food bites are conveniently available at your local Walmart, or can be ordered for a Walmart grocery pick-up. 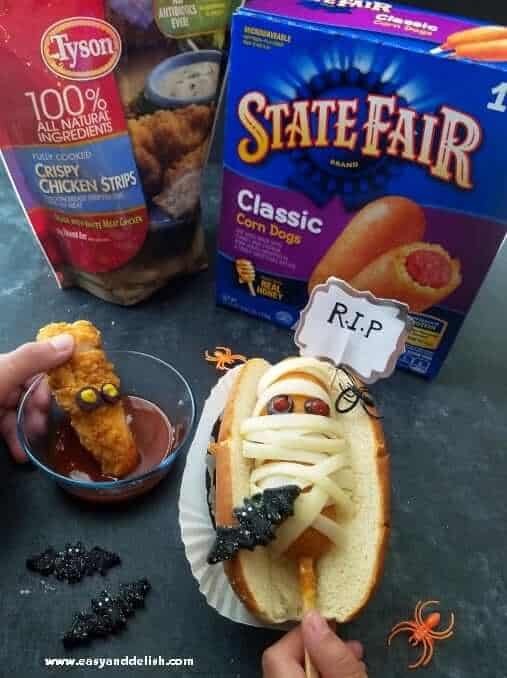 Well, are you ready to put our yummy Mummy Coffin Corn Dogs together? Cook corn dogs either in the microwave or oven according to package instructions. Meanwhile, arrange hot dog buns on a platter. Using a cutting board and paring knife, cut mozzarella slices into thin strips, and also slice olives (either black or green). Set aside! Then, wrap cooked corn dogs with cheese strips, giving them a mummified look, and tuck olives under a couple of strips to form the eyes. If desired, dot ketchup “blood” into the hole of the olive slice. 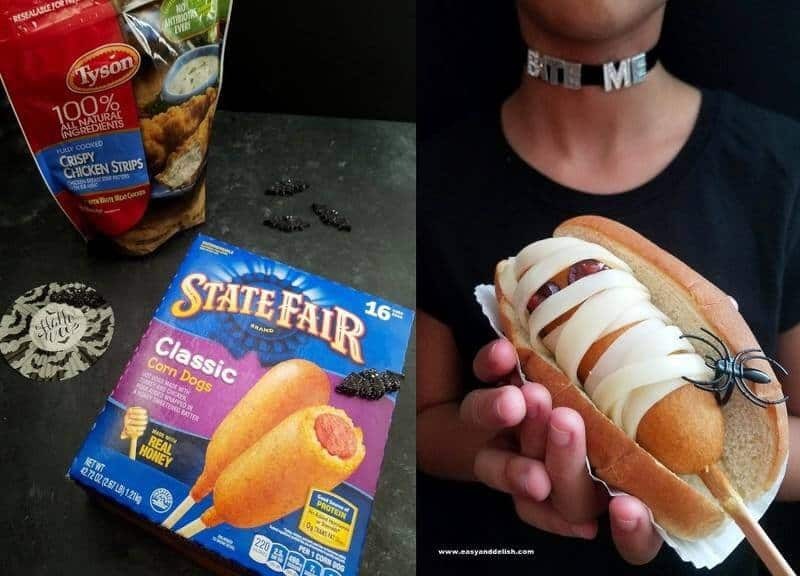 Place each corn dog into a bun and serve Mummy Coffin Corn Dogs accompanied by hot dog condiments such as ketchup, mustard, mayo, and/or relish. 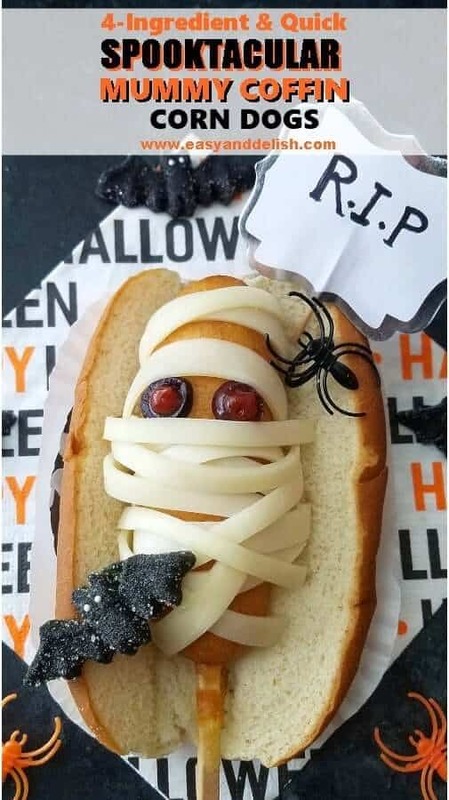 For more food inspirations, go to FeastOnFrightBites.com . Mummy Coffin Corn Dogs are a 4-ingredient spooktacular Halloween savory dish prepared in 15 minutes. A fun kid-friendly treat! Meanwhile, arrange hot dog buns on a platter. Using a cutting board and paring knife, cut mozzarella slices into thin strips and also slice olives (either black or green). Set aside! Then, wrap cooked corn dogs with cheese strips giving them a mummified look and tuck olives under a couple of strips to make the eyes. If desired, dot ketchup "blood" into olive hole. Place each corn dog into a bun and serve accompanied by hot dogs condiments such as ketchup, mustard, mayo, and/or relish. If desired, you can reheat the whole assembled dog in the microwave in order to melt the cheese strips a little bit (about 25-35 seconds). Spooky! Cute! And really, really creative. Fun stuff — thanks. Cute, cute, cute! 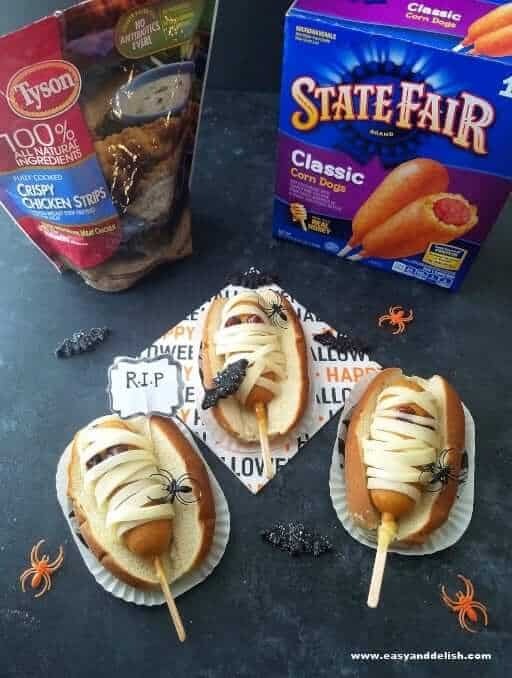 These Halloween corn dogs are perfect party fare.